"I've read many books that are heavy on theory and low on practical 'how to's'. This book, however, is a great blend of both. It's simply a record of how I've seen Ken live out his purpose for over 10 years. It's full of practical suggestions for weaving your deepest convictions into the fiber of your business, without compromise, by applying those principles daily as you set priorities and make decisions. This book will help and challenge any person who wishes to create a profitable business that also blesses others and reflects important core values. You can live out your God-given purpose through your business. This book will show you how." We live in a world that so easily separates business from heart. Your beliefs and principles are important to you, but it often seems you need to lay them aside in order to succeed in the workplace. The feeling that our convictions are out of place – antiquated dinosaurs in a fast-paced business environment — can leave us feeling detached and empty. 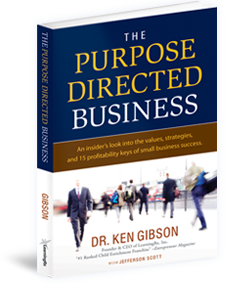 In his new book, The Purpose Directed Business, Dr. Ken Gibson reveals his own personal, life-changing struggle to integrate business and core values. Transparent and full of practical guidelines, The Purpose Directed Business is a must-read for anyone who longs to find true meaning in their work. Follow a confident entrepreneur on your journey towards discovering principles that will turn your success into a matter of identity and your profitability into true reward. Download The Purpose Directed Business for FREE! This will send a link to your Twitter followers about the free book. It will also add you as a follower to LearningRx, the brain training company founded by Dr. Gibson, and allow you to receive future updates about LearningRx. Dont have a Facebook or Twitter account? Click here to download the book using your email address. Copyright © 2002 - 2019 LearningRx, Inc. All Rights Reserved.